OH MY GOODNESS! Today is the Big Day!!! What are you doing the morning of your wedding? All too often when I ask this question my sweet brides start listing a million things they have to finish up and I just want to beg them to take it easy so I figured it was probably high time for a blog on this subject. The only things you should be doing the morning of your wedding are relaxing with your nearest and dearest and being pampered by your makeup artist, but here are a few of our tried and true suggestions! 1. Eat a big old breakfast! Then eat a big old lunch! You're probably not going to have another chance to eat for a very long time so eating now is essential. And odds are, your bridesmaids have lots of champagne ready to be poured so avoid getting tipsy on an empty tummy and eat up! Tip: make sure its high in protein and complex carbs to keep you going for hours. 2. Spend the morning with people you actually want to be around. There's no law or rule saying you have to spend the whole morning with every single person in your immediate and extended family, bridal party and well meaning visitors, so if a big huge group is not really your scene, ditch the crowd and just kick it with your mom and bestie! And guess what? If you want to sneak out and have coffee with your soon-to-be hubby, that's just fine too! The one and only person who was able to calm my nerves the morning of my wedding was Tony and thank god he stopped by the house to pick up his forgotten tie and check in on me. One hug and a smooch from that handsome fella was all I needed to soothe my frazzled nerves and get my day started right! So throw the rules away, smooch your sweetheart and dance on the bed with your bestie! 3. Stay hydrated! For every glass of champagne (or coffee) you have follow it with a glass of water. No, it will not make you look bloated but it will keep you from getting a headache or getting tipsy too early in the day. Seriously, nobody wants to be that hammered bride at her own wedding...save that for your bridesmaids weddings! 5. Steal one of your sweetie's favorite button down shirts to get ready in. When getting your hair and makeup done the morning of your wedding the last thing you want to do is wear a tee shirt that you'd have to pull over your beautiful hair and makeup risking smudges and smears and ruining your lovely hair. By snagging one of his beloved button downs your hair and makeup will be safe and your getting ready shots will be even more special. Bonus points if its one of his college team shirts! 6. Do a "First Look" with your parents or just your dad. 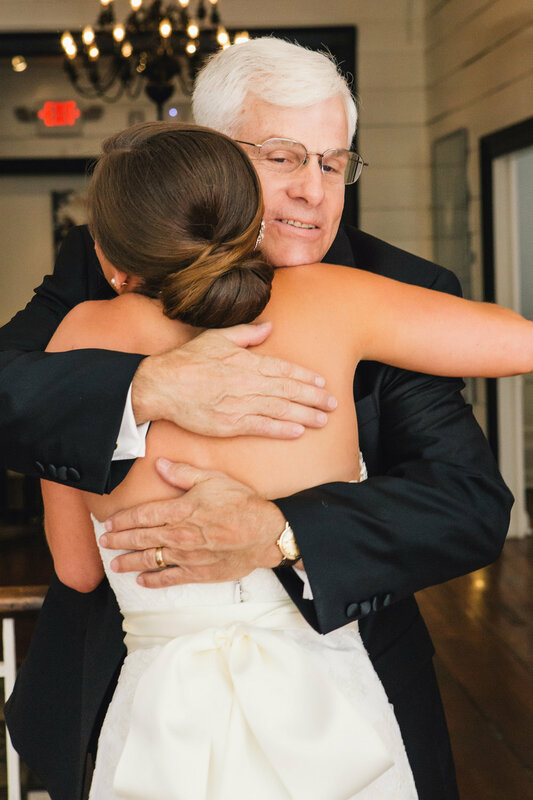 Everyone is always talking about the First Look with the groom, but the first time your mom and dad see you all made up and in your wedding gown, the tears are bound to flow and stunning heartfelt, tear-jerking photos are usually the result! 7. Take a few minutes alone to let it all sink in. Pray, meditate, cuddle with your dog, do whatever brings you peace when everything around you is going at full speed. You've spent months, maybe even a year or longer, planning a wedding and now that it's finally here, try to slow down for just a few minutes and find some quiet. This day is going to fly by and if you don't stop to enjoy it, it'll pass you by in the blink of an eye. Let the joy that this day is filled with come into your heart and just try to focus on the new life you and your beloved are forging from this day forward. Well, there you have it! 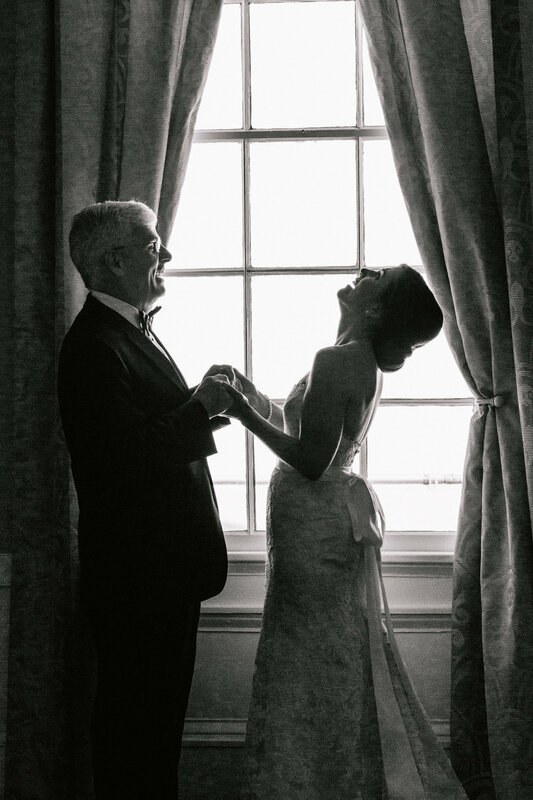 Those are our favorite tips and suggestions for the morning of your wedding! What are some of yours?